Women have been rockin’ the J’s film program lately! First, Ruth Bader Ginsburg came to visit a couple of weeks ago. It’s not every day that we have a Supreme Court justice here, on stage, for any reason. Justice Ginsberg – most gracious, thoughtful and displaying a keen sense of humor – was part of a panel talking about Yoo-Hoo, Mrs. Goldberg, another award-winning film by our very own star filmmaker, Aviva Kempner. The Justice appears in the film and came to share with the sold-out audience her thoughts and memories of the Goldbergs on radio and tv. She recalled her own family and childhood growing up in a working-class Brooklyn neighborhood. 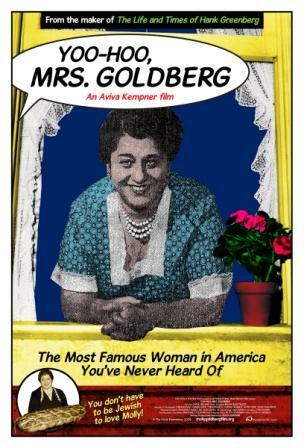 The event was a special program and party to celebrate the DVD release of Aviva’s film, which is about yet another groundbreaking woman, Gertrude Berg. And we’re not done yet. This week mother-and-business-woman-turned-filmmaker Vicki Abeles brought the DC premiere of her new film Race to Nowhere to our WJFF Year-Round screen. The film is a powerful and provocative exploration of our pressure-cooker educational system and its too often destructive effect on children and families. The discussion with Vicki after the film was serious, heartfelt and enlightening. Parents asked how they can help their kids, even those as young as pre-school. Speaking from the audience were principals of two alternative DC schools as well as teachers from DC, VA and MD – sharing their reactions to the film and their own experiences as educators. Some had questions and some wanted to support Vicki’s call for grass-roots action to make changes in the US educational system. One teacher, for example, expressed the desire to show the film to the as yet un-named new superintendent of the Montgomery County schools in the hope of helping the county schools move away from the emphasis on testing. For those of you who missed it, Vicki and the film will be at the Landmark Bethesda Row Cinema again on Monday, October 4. Now it’s time for me to get back to planning the 21st Washington Jewish Film Festival. Just wait until you hear what’s coming this December 2012!! More news soon. In the meantime, tickets are on sale for our next film program on October 18 – Sayed Kashua: Forever Scared plus one episode of this incredible author’s groundbreaking Israeli tv series, Arab Labor. With apologies to Twentieth Century Fox, below is a re-cut, nine-minute version of the classic 1951 film, The Day the Earth Stood Still. Why you ask? Because our CEO was watching the movie when she noticed a familiar sight, which comes onscreen just before the seven-minute mark. Along with some great shots of 1950s DC, is a vintage look at the corner of 16th and Q. Enjoy. I saw Avatar this past weekend and was blown away by its visuals and lush immersive world, even if the plot was about a half-inch deep. I was thoroughly won over by the 3D experience, and frequently had to remind myself that these 12-foot tall blue aliens on Pandora called the Na’avi were not real. So it was a bit of a shock to walk back into work on Monday and see a room full of Na’vi women (and Jewish to-boot) in our Ann Loeb Bronfman Gallery (on view through January 29th). Well, not exactly. But certainly the Omaticaya’s spiritual leader, Mo’at would not be entirely out of place amongst artist Siona Benjamin’s blue biblical women such as Miriam, Lilith and Tzipporah. Well before James Cameron was working with his CGI characters, Benjamin has been drawing inspiration from Hindu iconography to explore the challenges and contradictions of her own Indian Jewish (and American) identity. The accompanying guide to the exhibit states, “By reinventing and re-imagining various cultural icons of womanhood rooted in ancient and historical religious sources, Benjamin’s art opens up a new cultural and aesthetic space for the contemplation of diasporic realities including American popular culture, Hindu and Jewish beliefs, Middle Eastern politics and the strains of religious intolerance.” For Benjamin, blue skin is the symbol of being a Jewish woman of color. I emailed Siona to ask if she has seen the movie yet. I got a reply from India that she was travelling, but hoped to see it soon. I wonder how she’ll react to a planet filled with giant blue women? For those who are fans of the movie, I also recommend reading “Blueface, Whitenoise” by Jared Gardner in the Huffington Post which makes, I think, a very apt comparison between the themes of Avatar and The Jazz Singer. Internationally acclaimed and controversial film Adam Resurrected starring Jeff Goldblum and Willem Dafoe premiers in Washington, DC at the Hyman S. & Freda Bernstein Jewish Literary Festival. Don’t miss the premier on Monday, October 19! Click here for more information and tickets. Which Jeff do you prefer? Law&Order Jeff, Jurassic Park Jeff, The Fly Jeff or Independence Day Jeff? My personal favorite: Earth Girls Are Easy Jeff!